We do the bulk of our homeschooling in the afternoon with the girls while our youngest two are napping, but even then there are plenty of interruptions when we try to do quizzes or tests. There are times that the girls need some extra practice on some of the spelling rules and new words that they are learning during the week. Having them able to practice their word lists independently is extremely helpful because it allows me 1:1 time with the other child to help them in their studies. 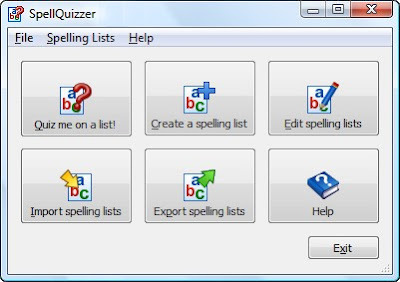 SpellQuizzer is a spelling software that allows you to enter your child's spelling or vocabulary list and make an audio recording of the word and a definition or 'clue'. Your child is then quizzed on the list one word at time and types the spelling word on the keyboard. SpellQuizzer immediately lets the child know if the word has been spelled wrong and later will re-quiz him once all the words have been spelled. At the end of the test he is told how many words were spelled correctly. My kids love working on the computer, so they have had a lot of fun using this program and are learning some great keyboard skills at the same time (a lovely added bonus). It also has helped break up the repetition of copying spelling words by hand and allows one child to be working on the computer while I have some 1:1 time with the other. The program is simple enough that the girls can open the program and click on the list that they are working on - all by themselves. In order to record the word clues/phrases for your children you do need a microphone attached to your computer (around $10 at Walmart). SpellQuizzer also has free lists online that you can import into your SpellQuizzer program. If you choose not to use the audio portion, you can instead type in a clue word or phrase for your child to use. SpellQuizzer is available to download for $29.95 and the company also offers a group discount (for co-ops, etc..) with a multiple license purchase. Downloading and installation is quick and easy and they also offer a free 30 day trial so you have a chance to try it out and see how it works for your family. If you would like a peek at program at work, be sure to check out the video demos that SpellQuizzer has available on their site. Click on the Homeschool Crew banner to read other reviews about SpellQuizzer. Your blog along with Carisa's ROCKS! I'm so glad you introduced yourself to me today. By the way I think your children are GORGEOUS and Kaleb well that smile would do me in all day! Thanks for all the time you put into the information you shared. I just read your blog back for about two months! I got tons of great ideas from you today! Blessings and love in Him!